Stewart-Haas Racing is the title-winning NASCAR team co-owned by three-time premier series champion Tony Stewart and Gene Haas, founder of Haas Automation – the largest CNC machine tool builder in North America. The organization fields four entries in the premier series – the No. 4 Ford Fusion for Kevin Harvick, the No. 10 Ford Fusion for Danica Patrick, the No. 14 Ford Fusion for Clint Bowyer and the No. 41 Ford Fusion for Kurt Busch. The team also competes in the NASCAR XFINITY Series by fielding a full time entry – the No. 00 Ford Mustang for Cole Custer – and one part-time entry – the No. 41 Ford Mustang. Based in Kannapolis, North Carolina, Stewart-Haas Racing operates out of a 200,000-square-foot facility with approximately 300 employees. Animink has been a partner with Stewart-Haas Racing since their inception in 2008, working with SHR on 2 previous iterations of their website. We have provided web hosting services, website maintenance services, app development, and represented SHR as an email marketing company, web development company, and ecommerce provider for over 8 years. The site was developed completely custom with WordPress, leveraging WP’s open-source platform. A media hub was introduced, allowing fans to quickly engage with the team and drivers through multiple social outlets within a single interface featured right on the home page. We also prominently featured a toggle to view race information for Monster Cup or Xfinity race information. Additionally, the ecommerce store was completely redesigned, allowing for a better user experience, and more controlled product management. 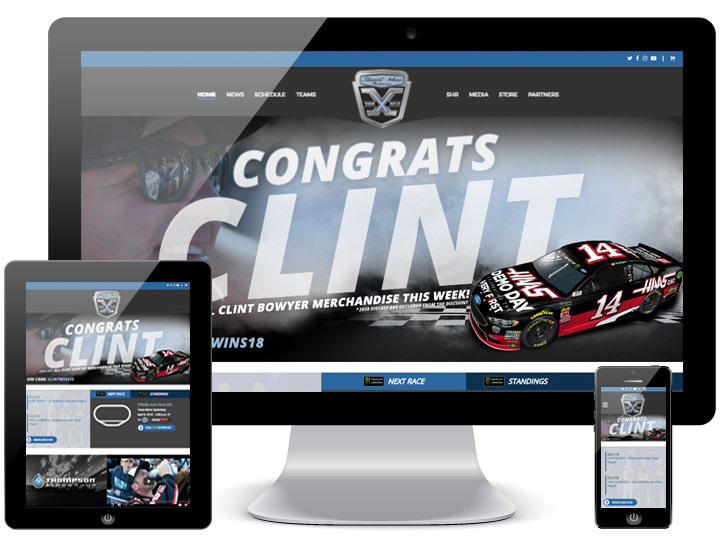 Lastly, a custom administrative back-end was created to allow the client to make timely updates on sponsor announcements, promotions, and race win graphics. An event-based system was also introduced, allowing the client to create events corresponding with each race, and add galleries, articles, videos and more. Each of these could then be assigned to an event, allowing users a simple one-stop experience to gather information about a race. As is with all Animink websites, the entire site was designed responsively for optimal viewing on all devices. However, the back-end of the site was also designed responsively to allow for updates while at-track, or on the go. Animink continues to provide web hosting services to SHR, as well as website maintenance services as needed. The site has received glowing reviews, and fans are finding it extremely user-friendly. If you’re looking for a web development company to manage your next project, look no further than Animink, a social media optimization company. Contact us today.